This is a product that takes itself very seriously. It comes with a CD with videos that explain what it is all about and show you how to use it. There is also a website with an impressive amount of information. The bit that interested me most was the clinical data. This has been done by a very respected testing house. Unfortunately I didn’t get a free sample – I had to pay the full £50 ($90), so this is a premium product and we are entitled to hold it to high standards. The product is aimed squarely at wrinkles. 0n the box the jar I have came in one side was given over to a named 43 year old woman, called Lisa Porter, with before and after photography. So what is the story? Apparently it is a special blend of Greek essential oils. I am not sure what is special about Greek essential oils compared to other country’s oils. Lets assume it is simply patriotism on their part and decide to find it charming. Essential oils can be biologically active so there might be something interesting going on here. I have never come across any evidence that they reduce wrinkles though – but l suppose it is possible and someone has to be the first to observe it. Turning to the product itself – my first reaction was to sniff it to see how all those lovely Greek essential oils smell. I have to say I could hardly smell anything at all. What I did notice straight away is that this is no ordinary product. I had been expecting a cream. What I got was a silica gel. This probably needs a bit of an explanation as it is quite unusual for a cosmetic. It is possible to make a kind of gel using fumed silica. This is a bit like very very fine glass. l had never thought of using this kind of gel on the skin before – but it seems to work well enough. But I wonder if it might have been better with a traditional cream base. I tried it for the prescribed 7 minutes. It did seem to have a bit of an effect but I only have very slight wrinkles so this may not mean very much. Turning to the ingredient list the thing that leaps out to me is the acetyl hexapeptide. Using peptides has become common lately. 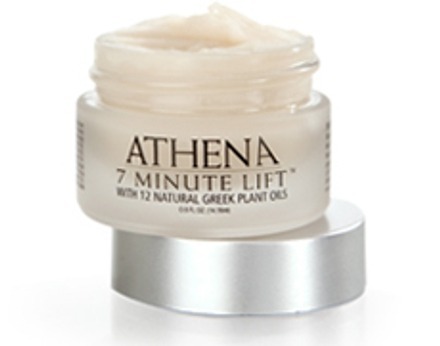 I talk about them on my guide to effective anti-wrinkle products. There does seem to be some evidence that this type of product can have some effect on wrinkles. They have done a proper study to show its benefits. This was done on their behalf by a respectable clinical trial company. I can’t do much better than to repeat their summary: “the product in seven minutes significantly reduced the appearance of fine lines and facial wrinkles an average of 83.72% on a full face evaluation. Maximum reductions of 90% were observed.”-AMA Laboratories. I know that there is a lot of cynicism out there about trials of this nature, and although it might be presented as favourably as possible there will be some effect that is being reported here. All in all this product ticks all the boxes and is a very respectable offering. But there is something about it that leaves me a bit cold. I don’t like the essential oil story – it is so obviously bogus. I should applaud the use of an original base, but it just annoys me. I don’t know how successful it has been but I don’t think it has built up any buzz around itself. I had a job even getting around to writing this review. The jar has been on my desk for months. I think the problem is simply that the product lacks personality. It is just boring. Hi, I have recently discovered your blog and I firstly want to thank you for relevant and scientific information. However, I would like to know where I could find an extensive chart, article or book on emulsifiers that will include such properties as optimum pH ranges, electrolyte interaction, viscosity, compatibility with other ingredients etc. Hello Susan, I don’t think such a book exists. But please do tell me if you find one.